We just had the first major storm of the season pass through the Metro area tonight. It brought some much needed rain to the area and also a hella lot of lighting. I was up at my real state agent’s office when the storm started and boy was it intense. And of course what happened? We lost power right in the middle of the fax mechanic sending my offer. Luckily it came back on with in a few minutest, but some places were not that lucky. Coming back for her office, there were 3 lights on Paseo Del Norte that did not have power. Also there was another light that had power, but was flashing red in all directions. FUN. Anyway, so my computer was off during all of this. When I got home, most of the storm had passed over so I turned my computer on. Well as soon as it’s finished booting up, I see this message from Dell. Okay, you're probably not going to believe me because this is too weird. But when it started lightning closer to the house around 7:30pm last night, I turned off the computer. The power went out, but when it came back on, I turned the computer back on. 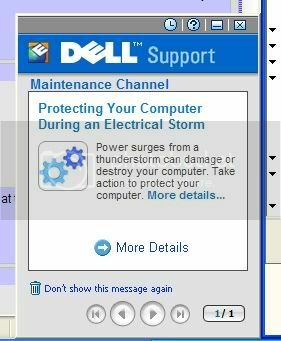 And my little Dell Support thing also popped up and gave me the same tip you have displayed in your post. I thought, "Wow, either my computer is super-smart or The Gods of Dell were watching me tonight." Weird. I believe you. Now the real question is did this go out to everyone, or was it only targeted to the Albuquerque area due to the storm? Beats me. What probably happened was some really large surges hit the power grid at your location during the storm. The surge strips you buy in the stores can't always fully protect against the really big surges. Your computer apparently has a portion of it that can detect big power surges even when powered off. I looked at the owners manual for an Inspiron, and they say that network adaptors cannot be protected by a surge protector, and that not all surge protectors can protect against big surges. Their advice is, during electrical storms, to unplug the network cable and unplug the computer from the wall. Your PC actually took some sort of a hit last night, and you may need to replace your surge strip.